If you haven’t yet contributed to Renters’ Rights London 5-minute survey on affordability, please do? That survey closes at 1300h on Monday 1 April. Under new regulations which come into effect from 1 April, all property agents in the private rented sector must join a government-approved scheme to protect their clients’ money. About 60% of agents signed up to client money protection schemes (CMP) voluntarily. Now, mandatory membership will ensure that every agent offers appropriate financial protection to renters. Government has approved five CMP schemes. Every property agent who holds clients’ money is required to register with one of the above schemes before 1 April. You should be able to see details of their CMP membership clearly, in their offices and on their website. If any agent fails to display this information, you can report the matter to Trading Standards Officers of the local council. They have powers to levy fines of up to £5,000 for a first offence. Any further offence within a five year period could mean a fine as big as £30,000. We welcome the Homes (Fitness for Human Habitation) Act 2019. This law states that property owners must ensure the houses and flats they rent out are safe and secure, warm and dry, at the start of each new tenancy. Also, that rented homes must be maintained to remain free from hazard throughout. This is good news. There are new powers for renters living in poor conditions to pursue their landlords in the event of any breach. These powers apply to council and housing association (HA) tenancies, as well as in the private rented sector. And actually, Renters’ Rights London sees these new powers as most useful to people with council tenancies. Although most people who rent council-owned homes enjoy security of tenure, these renters have not been able to ask environmental health departments to act against their landlord where there is hazard or serious disrepair. This is because a council cannot easily act against itself, of course. Now, though, all renters can take action themselves. For private sector renters, taking action against a landlord during the term of an assured shorthold tenancy might well be essential. But the Homes (Fitness for Human Habitation) Act 2019 makes no mention of protection from revenge eviction after initiating such an action. If you have to do so, we fear there is high likelihood that you will receive a Section 21 notice at the first possible opportunity; two months before the end of the fixed term. Renters’ Rights London is also concerned that overburdened environmental health officers will advise people in privately rented homes to purse the landlord themselves, rather than acting on behalf of renters, as they are empowered to do. We would like more councils to make better use of the full range of their (extensive) powers in relation privately-rented homes. But we know, too, that there are only 2.5 environmental health officers per 10,000 of population across England. Services are severely overstretched. Most privately rented properties in Waltham Forest are licensed. The council understands property licensing to be the most effective way of ensuring safe conditions, proper standards of management and occupation levels within legal limits. Over-occupation of private rented properties leads to what is seen as anti-social behaviour (ASB). As every property licence states the maximum number of people who can legally share any address occupancy of a rented home, licensing can reduce ASB. The current licensing scheme expires at the end of March 2020. Such a comprehensive scheme requires approval from national government (from James Brokenshire, the Secretary of State for Housing). To help make the case, Waltham Forest is currently consulting with local residents. If you live in or near Waltham Forest (which borders of Haringey, Hackney and Newham), Waltham Forest Council would like to hear from you. Please contribute to this consultation (closes 29 April). 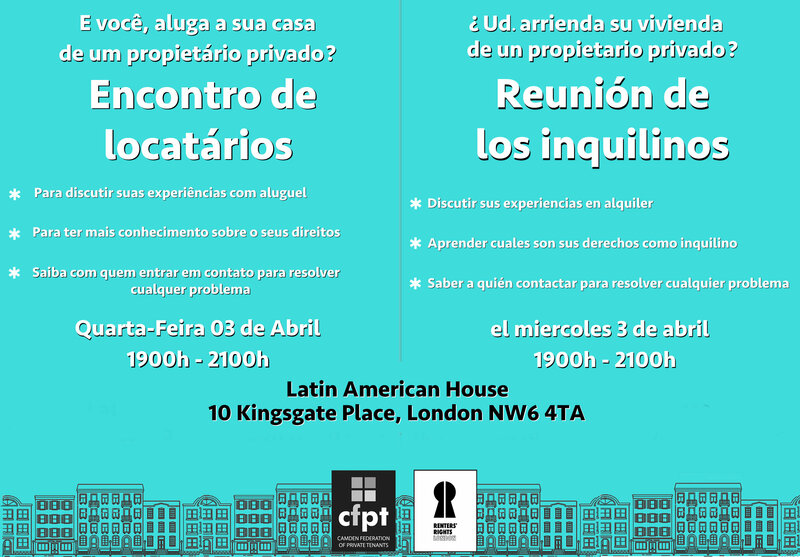 What do you think are the main issues with renting privately in London? Have you heard of open-ended tenancies? The Mayor of London, Sadiq Khan, would like to know. You’ll have to log-in to the Talk London site to contribute but the survey only takes five minutes. Please contribute a response.